The Nigeria Customs Service(NCS) on Tuesday sought for closer collaboration with the Nigerian Navy to enable it fight smuggling activities on the coastal waters to block more areas of revenue loss. 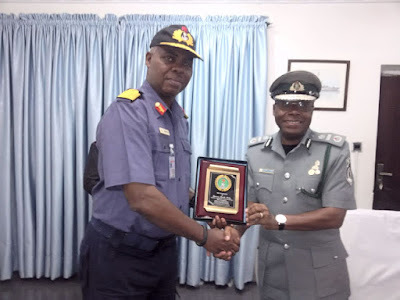 The Assistant Comptroller-General of Customs in charge of Zone ‘A’, Mr Eporwei Edike, made the appeal on his courtesy call to the Flag Officer Commanding, Western Naval Command, Rear Admiral Onyekwere Osondu. The ACG said that such revenue losses occurred when vessels engage in Ship to Ship(STS) transfer of petroleum products mid-stream without calling to the customs ports where they would pay appropriate duty to government. He said the zone was not leaving any stone unturned to ensure that it did not fail in its position of contributing about 75 per cent of the customs annual revenue. “Zone ‘A’ is very crucial as we take charge of 16 Area Commands and contributes over 75 per cent of revenue to the customs service revenue. “With dwindling oil revenue, customs is being looked upon, so, we are looking at more collaboration with sister agencies for better service delivery. “We know you have a role, but we also know that you can assist us more, so we can improve on revenue collection for government. When you are out there and you see people doing mid-stream discharge into smaller vessels, frown at it because every vessel is supposed to come into the customs ports to enable government get revenue,” Edike said. He noted that the customs needed the assistance of the Navy for closer marking of the creeks, which he said were so many for the marine customs alone to monitor, considering that water is the main place of operation for the Navy. “There are many creeks in Lagos, which is a big task for customs officers to man, let alone the ones in Edo, Ondo, Delta, Bayelsa, Rivers, Cross-River states. 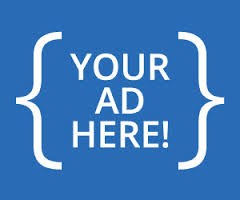 “You are always there and you can do a lot to help in checking the diversion of government revenue. He thanked the FOC, for the assistance offered by his men to the customs marine command, which had recently helped in arresting smugglers of marijuana in 48 jumbo bails being transported in boats. He also appreciated the navy for its presence in Tongeji Island, a place very close to Port Novo in Benin Republic, which if left unattended could serve as haven for smuggling activities. He said the customs had improved on it efficiency of checkpoints to the land border along the Lagos- Badagry expressway, which caused smugglers to resort to the creeks. He promised that with collaboration with the navy, the creeks would also be an uneasy place for smugglers. Responding, the FOC, Western Naval Command said the Navy’s mandate to support the customs was a national assignment that navy did with dedication . He assured the ACG of the progress being made with respect to its surveillance system to tackle crime and criminality on the Nigerian waters. “We have set up a surveillance system and I monitor and see up to Togo , Cote d’ Ivoire, every ship that comes into our waters, but my interest is on our borders with Benin Republic. “STS is not allowed and any time we see any two ships like that I detail my men there and in most cases we detain them at the anchorage and such people are brought here to explain their activities. “If there is going to be an STS, it must be approved and monitored, in which case it is only petroleum products and nothing more. “We are not just assisting the customs, it is our national call. We are like broomsticks. No single broomstick cannot sweep clean unless you gather them together. That is what we call synergy,” the FOC said. 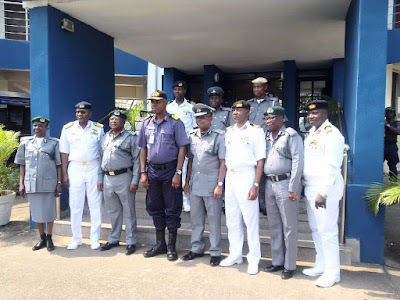 He assured that the navy would hand over all arrests made to the customs service after appropriate documentation, since the navy does not have a right to prosecute. “We don’t have prosecuting rights, but whenever we arrest, we handover to the customs or any other appropriate government authority after the necessary documentation has been done. The Rear Admiral asserted that the navy had the capability of tracking down anything on the Nigerian waters, adding that its newly-introduced choke-point strategy, and houseboats stationed at entrances to creeks, had made it very uneasy for smugglers as a number of the over 3000 creek entrances had been blocked. He also said that the navy had made efforts in encouraging some shipper groups who came to ascertain the safety of the West African waters and the Gulf of Guinea areas. He said that recently, the surveillance system made it possible for the navy to rescue a vessel and its crew and arrested the hijackers because they were able to track the vessels outside of Nigerian waters. On the issue of Tongeji Island, Osondu said about 100 navy personnel had been sent there to have a government presence in the place, which he said is very close to Port Novo and could be a veritable place for smuggling activity if there was no presence of security agencies there. He added that if properly put to use, Tongeji would be a commercial hub for the nation’s economic benefit. Osondu pledged continued support for the Nigeria Customs Service to protect the waters and fight against all activities likely to sabotage efforts for government revenue collection.